1 "Dad" Applegate Dead", "His Hotel at Cheesequake Noted Resort for Sportsmen" ..... Charles M. Applegate, familiarly called 'Dad' by his acquaintances for many years, died at the home of his daughter, Mrs. Edward Hartenstein, at Freneau, on Monday aged 79 years. Mr. Applegate had been failing for some time and his death was due to general debility. Mr. Applegate was the son of William and Matilda Applegate, who kept the hotel at Cheesequake Creek. This hotel has been operated by the Applegate family for over 100 years. About four years ago, 'Dad', left it and came to Freneau with his wife, where they have since lived. The hotel at the Creek is now run by Wood W. Applegate, a brother of the deceased. "Dad' Applegate was an all-around sporting man and his hotel at the creek was the headquarters for many prominent men who devoted a part of their time to fishing. Governors Ludlow and Abbott were frequent visitors there, as were also politicians from all over the state. The cuisine of the hotel was superior to most country hotels and a chicken dinner was always served to guests and every attention paid them so the reputation of the hotel was maintained and extended as headquarters for sporting men. Besides his widow, Mr. Applegate leaves five children, all grown. They are Mrs. Lois Hartenstein, Richard and J.E. Applegate of Freanu, Mrs. Mary B. Snyder and Stanton Applegate of Perth Amboy. One brother and four sisters also survive him. They are Wood W. Applegate and Miss Elsie M. Applegate of Morgan. Mrs. Meta Clark and Mrs. Elizabeth Perrine of New York and Mrs. Mary A. Martin of Long Branch. 6 (Documents from the Louisiana Supreme Court File in Applegate, et al v. Morgan et al, Docket # 1387 (April, 1827). Final Decision reported at 5 Mart. (N.S.) 642 (1827). To the Honorable the judge of the Third Judicial district, holding sessions in and for the Parish of Feliciana, State of Louisiana. The petition of Richard Applegate and Rhode Applegate residents of Mason County, State of Kentucky respectfully represents that they are the Heirs at Law, in the direct line, of Abraham Applegate who departed this life in this Parish some time in the year 1820, that James Small applied for and obtained letters of curatorship from the judge of Probate of the Parish aforesaid, and on the 26th day of August 1820, entered into a bond of one thousand dollars with Isaac Morgan and Solomon M. Brian as Securities, for the faithful discharge & performance of the duties of a curator, as will appear by reference to a certified copy of said Bond hereto annexed and prayed to be made a part of this petition. Your petitioners charge that the said James Small by virtue of his authority as curator reduced into possession the Estate of Abraham Applegate deceased; but that he has not [illegible] truly and faithfully discharged and performed his duties as aforesaid curator, for they [illegible] the said James Small among other things did not inventory as the property of the said Abraham deceased - a Grey Horse worth one hundred and fifty dollars, which was the property of the said Abraham, and which the said James Small knew to be such, but did fraudulently use and appropriate said Horse to his own use and benefit; and they moreover charge that in many particulars the Inventory of the said Abraham's Estate returned by the said James Small was willfully incorrect and incomplete. Wherefore, your petitioners pray that the said Isaac Morgan and Solomon M. Brian, Securities aforesaid, may be cited to appear in this Honorable Court in due course of Law, and sentenced, judged and decreed to pay the some of one thousand dollars, the amount of the bond signed by them as Securities aforesaid, costs of suit, and for general relief. We the Subscribers, two of the Commonwealth's Justices of the Peace for the County and State aforesaid, certify that Richard Applegate and Rhoda Applegate whose names are subscribed to the above power of attorney, this day came personally before us and acknowledged the same to be their hands and seals, acts & deeds for the purposes therein mentioned—we further certify that Benjamin Kirk aged 61 years and Zephaniah Watson age 61 years & [illegible] on oath that the said Richard Applegate and Rhoda Applegate are reputed the Father and Mother of Abraham Applegate who died at or near St. Francisville Louisiana, in the year A.D. 1820. Before me Thos. Keith a justice of the Peace in and for the county of Mason, Richard Applegate and Rhoda Applegate his wife acknowledged the foregoing power of attorn to be their act and deed for the purposes therein contain. Kirk & Watson deposeth not in my presence. I Thos. Keith the subscribing Justice of Peace to the last certificate to the foregoing power of attorney do certify that Richard Applegate & Rhoda Applegate his wife are the reputed Father and Mother of Abraham Applegate who left this county in the Spring 1820 and has never returned. It is reported and believed that he died at Saint Francisville on the Mississippi River. I Marshall Key, Clerk of the county court of said county, certify that Thomas Keith Esqr., who hath granted the foregoing certificates is now and was at the time of so doing, a justice of the peace in and for said county, duly commissioned and qualified, and that to all his official acts as such full faith and credit is due and ought to be given. In testimony whereof I have hereunto set my hand and affixed the seal of said court the 14th day of April 1823. William Bryan, Presiding Magistrate of the county court of said county, certify that the foregoing attestations of Marshall Key, who is clerk of said court, is in due form of law. An Inventory and Estimation of the property belonging to the Succession of Abraham Applegate, dec'd, made by W C Wade Judge of the Parish aforesaid, this 10th August 1820 and appraised by James P. Smith and John Ketchum, duly appointed and sworn for that purpose and taken in presence of Isaac H Roe and Robison Mumford, assisting witnesses. And there being no other property found this Inventory was closed on the [illegible] and in the presence of the witnesses aforesaid, who sign hereunto with me said Judge. One straw hat, two shirts, two pairs of pantaloons and one Velvet roundabout and one pair of old boots, one new Pocket Book one Bay Horse in the Possession of John G. Grady. In obedience to an order received from the Honorable the third district court for the Parish of East Feliciana, I, Joseph Bernard, a justice of the Peace, acting in and for the Parish of West Feliciana, proceeded to take the depositions of the persons named below; first having sworn them upon the Holy Evangelists. Monday 6th December 1824 - Hugh B. Maxwell sworn says that he know Abraham Applegate who died in the Parish of Feliciana, in the summer of 1820 —Here the Examination adjourned until tomorrow morning at 10 O'Clock A.M.
Tuesday, December 7th 1824 - Hugh B Maxwell continuing from yesterday - says, that from various circumstances that came to his knowledge, he was under the impression at that time and believed that Applegate & Small was in partnership in some produce, that was on hand at the time of Applegate's death. Witness states, that there was a deduction made from the amount due by witness to Applegate's Estate; but the precise amount of it he cannot now state, as he kept no regular books at that time; he thinks the amount count not exceed from fifteen to twenty dollars at most, but may have been more. James P. Smith being duly sworn on the part of the defendants, testifies— that in August and September 1820 a quantity of Flour was stored in the ware House of John Ketchum [illegible] belonging to Abraham Applegate, that on the 16th September of the same year, as appears from the Books of Ketchum [illegilbe] he received from James Small, the sum of twenty eight 50/100 dollars for the storage of the said Flour—that the charge in the Storage Book is Twenty Eight dollars and eighty seven & half cents, and further saith not. And there being no other witnesses produced the above examination is closed, the depositions of the witnesses having been reduced to writing by me the said Justice. Inventory and appraisement of the estate of Abraham Applegate deceased returned as follows. ditto paid do his bond & int. In pursuance of an order of the Mason County Court to us directed, bearing date February 1822, which is hereto annexed, we have proceeded to examine, state and settle the accounts of Benjamin Applegate administrator of Abraham Applegate deceased and find a ballance [sic] of two hundred and seventy three dollars thirteen and a half cents due the said Benjamin Applegate administrator and from the charges an vouchers to us produce, the same appears to be just. Given under our hands this 10th day of February 1823. This account current of the estate of Abraham Applegate deceased was returned in Cout, examined, passed, allowed and ordered to be recorded. 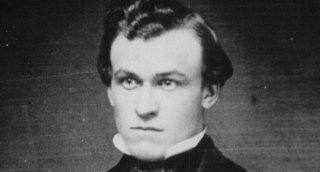 JUDSON APPLEGATE, one of the promising lawyers of Tacoma, was born at Utica, New York, April 29, 1835, and is a son of Furman and Emily J. (Fox) Applegate. The subject of this sketch was reared in Montgomery County, New York, and received his educational training at Antioch College, Yellow Springs, Ohio, where he was graduated in 1862. He taught school for a short time, and then removed to Indiana, where he began the reading and practicing of law with Judge Jonathan C. Applegate, a second cousin. He was admitted to the bar at Frankfurt, Indiana, in 1863. He practiced at Delphi, Indiana, for many years, and was recognized in that state as one of its ablest lawyers. He came to Tacoma in March, 1889, and now ranks among the most successful and prominent of the Washington bar, maintaining a practice in both State and Federal courts. He has served as Master of Mount Olive Lodge. No. 48, F.&A.M. at Delphi, Indiana, and now affiliates with State Lodge, No. 68, Tacoma.